The lovely valley of the river Era extends in front of the slopes of Volterra. This lush region is filled with healing waters and has been inhabited since the Etruscan period. The presence of the Etruscans is witnessed by many highly cultural monuments and finds. 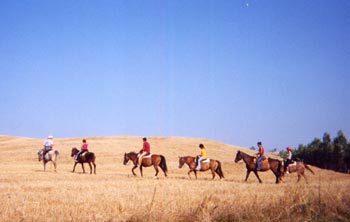 The gently rolling hills and the deep green cypress are fertilized by four rivers: Era, Arno, Roglio and Cascina. Nature lovers and sports enthusiasts are inspired by panoramic hiking paths. Who, however, is looking for a holiday full of wellness and relaxation, finds in Casciana Terme, a glamorous spa resort, a rich offer. The spa, which was founded in the 11th Century, has already been known in Roman times for its healing hot springs. 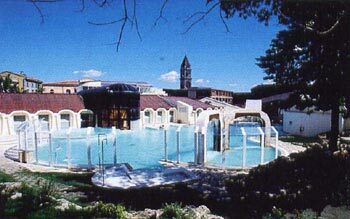 The wellness center is a welcoming facility, which is situated in the charming village center of Casciana Terme. From the external thermal pools one enjoys a picturesque view of the surrounding parks. In its elegant and comfortable interior, visitors can enjoy all kinds of massages and thermal treatments. The harmony between body, mind and spirit will be balanced with the help of warm water, fango and oriental massages, and under the supervision of experienced professionals. The thermal water is particularly famous for healing venous blood circulation disorders, rheumatism and arthritis, rhinitis, pharyngitis, bronchitis and all kinds of gynecological diseases. The spa also offers drinking cures. The water, which is enriched by calcium-sulfate-bicarbonate helps for diseases of the liver and bile duct.